Contemporary chemotherapy for advanced breast cancer (ABC): Have we hit a glass ceiling? Progression beyond trastuzumab: Where are we now? Conclusions and overview of the journeys ahead (W. Janni, DE). Posters can be viewed from Thursday, 7 November, 11:00 hours till Saturday, 9 November at 13:00 hours.br> On Friday, 8 November, during the lunch break from 13:00 to 14:00 hours, the poster session will be held with the visit of the designated members of the faculty. 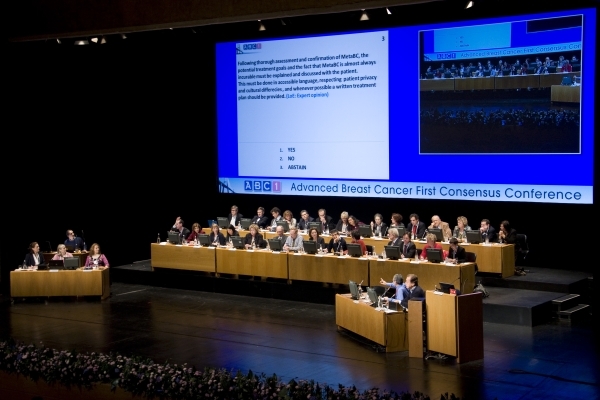 The Panel will update the ABC consensus recommendations for the management of advanced breast cancer continuing the work developed during ABC1. The ABC2 consensus manuscript will be published after the meeting.